Property encroachment can be dealt with in ways that satisfy everyone. 2. Who Pays Property Taxes on Right-of-Way Easements? 3. Does Property Size Increase Home Value? Home ownership brings with it responsibilities, not the least of which is ensuring that any renovations or improvements respect the limitations imposed by your property lines. Being familiar with your property's boundary lines as noted on a recent survey and the ways you might unintentionally encroach on your neighbors' property will best ensure that any property encroachment problems that do occur will be minor, such as an overgrown hedge. Such knowledge will also make it more likely that should a case of property encroachment occur, it can be resolved with a friendly conversation. Property encroachment occurs when one property owner builds something on the property of a neighbor or allows something to protrude onto a neighbor’s property, each of which violates the neighbor's property rights. For example, an encroachment occurs if the structure of a neighbor’s building, fences or gardens extends beyond a lot line onto your land. Whether the offense is a fence that extends a foot or two over a neighbor’s property line or tree limbs that complicate a property owner’s access to his storage shed, property encroachment can affect your ability to market and sell your property. An encroachment can also lead to claims for adverse possession that can result in your neighbor taking your land if his actions meet an adverse-possession cause of action. Any time one of your structures or other physical objects illegally protrudes from the ground or above the property of a neighbor, such as a tree limb, your property may be illegally invading your neighbor’s land. The encroachment may be intentional or unintentional. For example, a neighbor’s hedge planted to separate his property from yours may grow over time and inadvertently extend over your property. A neighbor might also intentionally build a stairway, a driveway or retaining wall that extends onto your property without your approval. Unless a formal agreement or easement exists that grants the neighbor or another party permission to use your property, encroachment may occur. A neighbor encroaches on your property if he trespasses onto your property – enters your property without your permission -- or advances his property beyond established legal limits. In some cases, property encroachment occurs because homeowners do not possess a valid property survey and are not aware of the location of property lines. For example, your neighbor may rely on an invalid survey when installing a fence. In other cases, the property encroachment is the result of a contractor erecting a building, retaining wall or other structure based on misinformation or the incorrect interpretation of your neighbor's instructions. In other instances, a neighbor may be aware that he has constructed property on your land and that, in doing so, he is violating your property rights. A property survey provides information regarding the physical layout of your property, including metes and bounds measurements. Whereas metes describe your land with directions and boundary measurements, bounds are descriptions of your property using physical structures or natural phenomena, such as a waterway, building or public road. A survey also shows locations of property improvements, including houses, driveways or sheds. In addition, the survey identifies any property encroachments on your property or your neighbors'. In turn, an inspection of an existing survey by a title company identifies property improvements that were completed subsequent to the original survey and that encroach on your property. 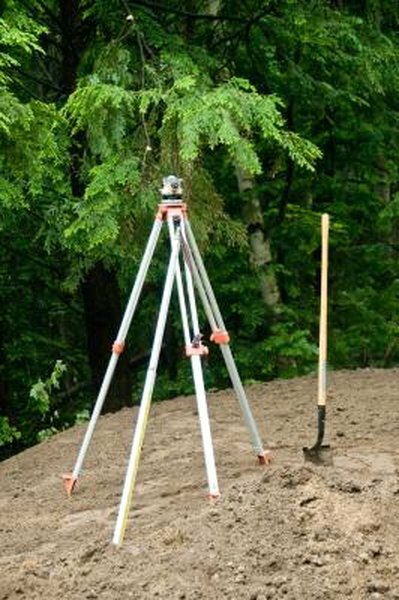 You can best ensure any improvements you make near a property line will fall within your property boundaries if you rely on the property survey when designing any changes you want to make.